San Diego based graphene and 2D materials producer Grolltex has completed characterization and is releasing for commercial sale a configuration of large area, single layer graphene that exhibits dramatically improved ‘electron mobility’, which translates to better graphene performance. This ‘heterostructure’ contains a layer or layers of hexagonal Boron Nitride (or ‘hBN’) underneath graphene, enabling enhanced graphene capabilities. 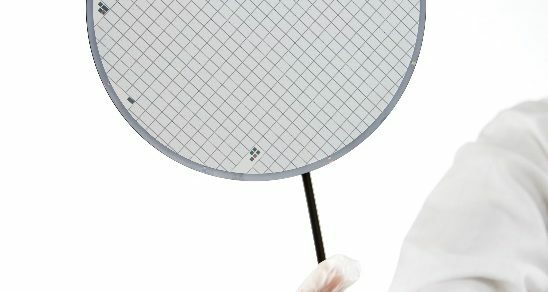 Grolltex has begun commercial pre-sales to customers of this ‘Enhanced Performance Graphene’ product, which can significantly improve device performance for sensing, transistors, connectivity and other key aspects of nano-devices. This type of material performance improvement is often a stepping stone for new applications enabling large market growth toward faster, smaller, cheaper and more sensitive silicon-based devices. “The data back from our large European device partner showed carrier mobility performance improvements starting at 30%, and our internal work shows us that with some configuration adjustments, we can even build on this toward electron mobility improvements in exponential regimes”, said Jeff Draa, Grolltex CEO and co-founder. “We believe this is going to be incredibly important to many of our customers that build things on silicon”. The first reason for the improvement of graphene electron mobility performance, when layered on top of hBN on a wafer, is that the underlying layer of hBN, between the wafer and the graphene, planarizes the surface of the silicon wafer and allows graphene to sit on a surface (hBN) far more conducive to graphene electron flow. Another reason has to do with the electron interference of the oxide coming out of the underlying Si/SiO2 wafer, if graphene sits directly on top of it. With the hBN layer between the graphene and the wafer, the negative effect of the oxide from the wafer on graphene electron performance is greatly reduced, allowing a much freer flow of graphene electrons. Additional advantages are lower processing temperatures and a much stronger adhesion of the graphene layer to the underlying substrate, with hBN present. “So, when graphene sits on hBN, it performs much closer to the theoretical ‘electron superhighway’ that graphene users expect”, according to Draa. “We have characterized and are selling this heterostructure to our pre-qualified customers in up to 8” (200mm) diameter configurations and can layer hBN and graphene in any combination”. Grolltex, short for ‘graphene-rolling-technologies’, uses patented research and techniques initially developed at the University of California, San Diego, to produce high quality, single layer graphene, hexagonal Boron Nitride and other 2D materials and products. The company is a practitioner of, and specializes in, exclusively sustainable graphene production methods and is committed to advancing the field of graphene to improve the future of leading edge materials science and product design through the optimization of single atom thick materials. Grolltex, Inc., is a nanotechnology materials, products and equipment company focusing on the optimization and advancement of the key monolayer material ‘graphene’ and related 2D materials. The company holds a number of strategic patents and technological advantages in areas relating to the manufacture of high quality, monolayer ‘CVD’ graphene and hexagonal Boron Nitride as well as on several advanced products made of graphene and 2D materials, such as hyper efficient solar cells, next generation sensors, advanced fuel cells and futuristic super-thin and flexible displays for use in wearables, smart phones and other electronics. Attn: Media Relations, Grolltex, Inc.